The mass airflow sensor (MAF) measures the amount of air entering the engine. The OBD-II code P0101 is set when the signal from the mass air flow sensor is out of expected range, or in other words, the MAF sensor doesn't work properly. In most cases, this code is not very difficult to diagnose. Because the mass air flow sensor readings are used to calculate the engine load, the traction control system may stop working and the traction control warning light might also come on on the dash. For the same reason, the automatic transmission shifting pattern may also change. First the mass air flow sensor must be checked and cleaned if dirty. 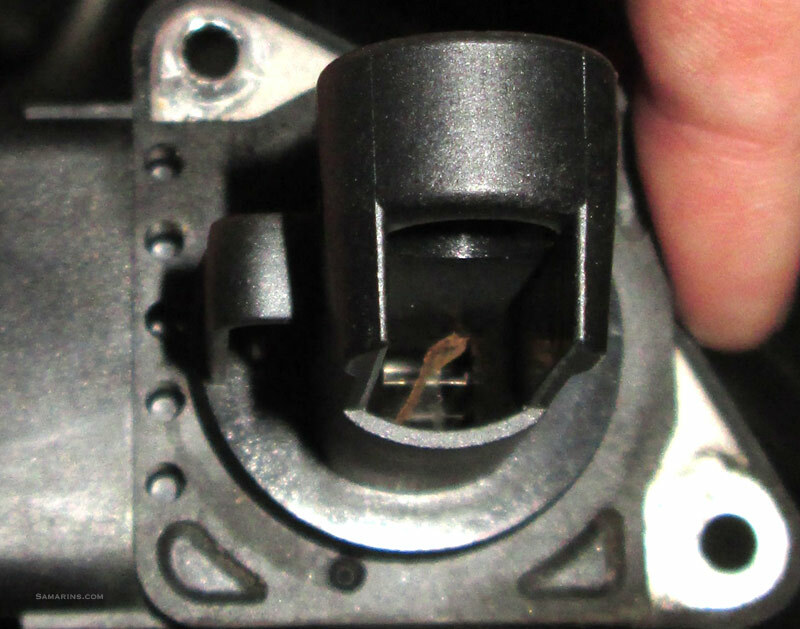 Sometimes a foreign object like a leaf or dust can clog-up the airflow sensor measuring element (hot wire) causing this code. See the photo of a clogged up mass airflow sensor below. If the problem started soon after the air filter was replaced, the air filter installation as well as the air flow sensor must be checked. In some cars (e.g. Volkswagen) a metal mesh intake screen installed before the air filter can be plugged up too. It must be checked and cleaned. 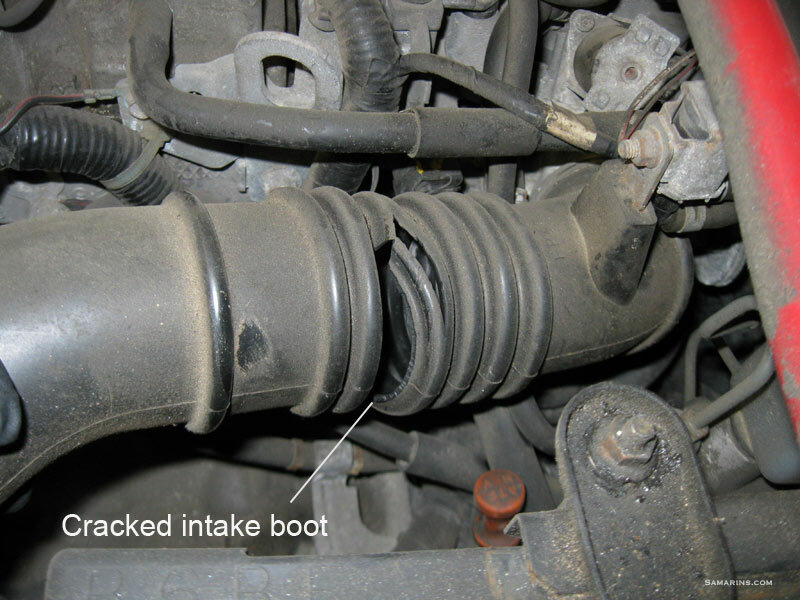 The intake boot must be inspected for cracks and rips. This problem is common in many European vehicles, e.g. BMW, Volvo. Other possible sources of vacuum leaks must be inspected. In some vehicles (e.g. Chevy Tahoe, Silverado) the code P0101 can be caused by a clogged catalytic converter. To diagnose this issue, exhaust back pressure or the engine vacuum must be checked. 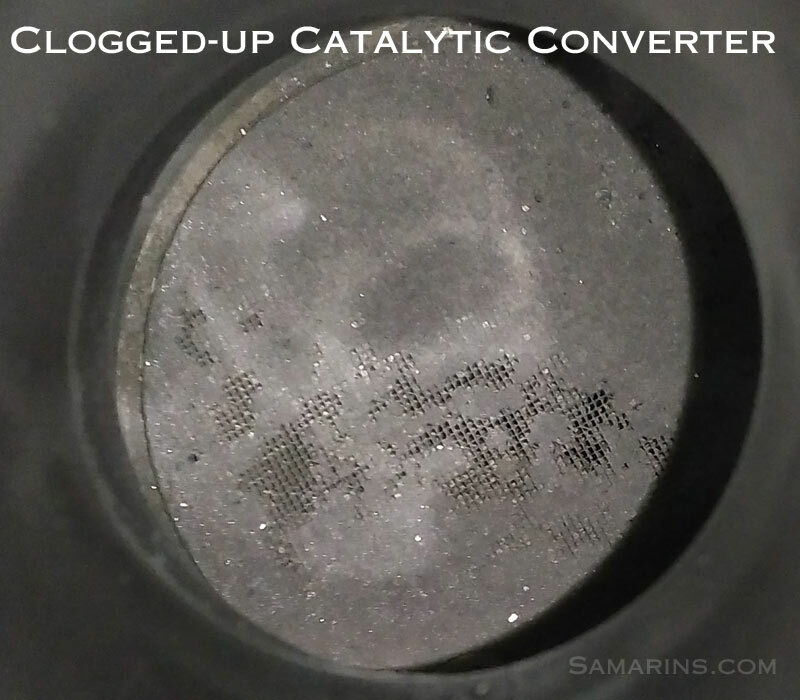 Read more about symptoms of a clogged catalytic converter below. Often the code P0101 is caused by a vacuum leaks. 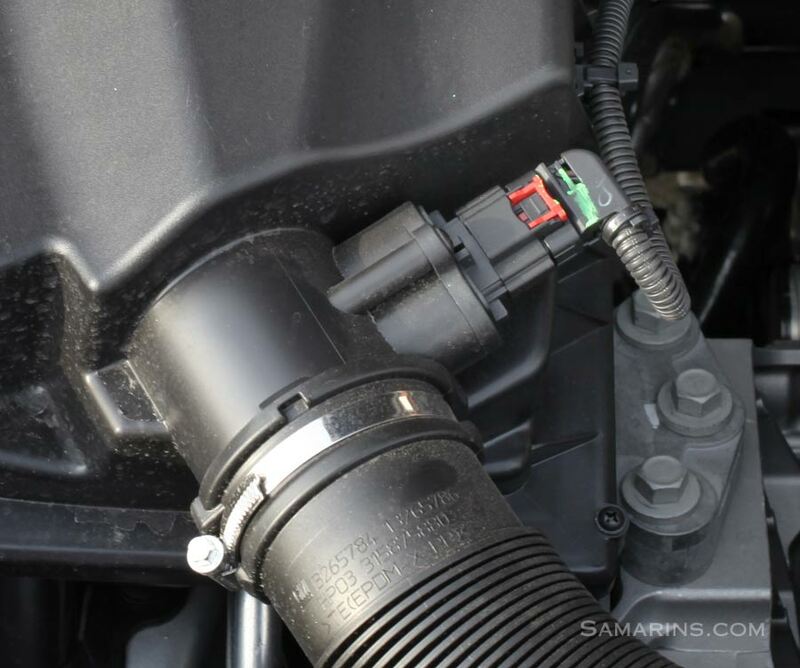 A vacuum leak allows "unmetered air" to enter the engine by-passing the airflow sensor. In the first photo, you can see a cracked intake boot. The amount of air entering the boot through this crack is not measured by the sensor, therefore the airflow sensor reads a much lower amount of air flow than actually is. One of the symptoms of a vacuum leak is the hissing noise from under the hood when the engine is idling. Read more: Vacuum leaks: common sources, symptoms, repairs. In the second photo, you can see a chunk of a leaf that blocks the sensor wire. Because of that, the sensor cannot read the airflow properly and sets the code P0101. Another issue in some GM trucks is leaking intake gaskets. One of the symptoms of a leaking intake gasket is the engine running rough when started cold. In vehicles with an oil-soaked aftermarket air filter, oil from the air filter can contaminate the MAF sensor element, causing the code P0101 or other MAF-related codes. In some Volvo cars, the code P0101 could be caused by a dirty throttle body or vacuum leaks in the PCV system (e.g. vacuum line to the oil separator). A dirty throttle body will need to be cleaned and the intake will have to be tested for vacuum leaks. A technical service bulletin for some 2011-2012 Nissan Altima, Maxima and Sentra models recommends reprogramming the ECM (engine computer) if the code P0101 is stored and there are no driveability concerns. The code P0101 means that the signal from the mass air flow sensor (MAF) is out of expected range. The MAF sensor is installed in the engine intake, right after the air filter. it measures the amount of air entering the engine through the throttle valve. The engine computer (PCM) uses the signal from the MAF sensor for operating the fuel injection system. When the car is accelerated, the throttle valve opens and allows more air to flow into the engine. The MAF sensor detects the air flow and sends the signal to the engine computer, which in turn commands the fuel injection system to add more fuel. Similarly, when low air flow is detected, the PCM reduces the fuel supply. The PCM checks the rationality of the MAF sensor signal by comparing it to the signals from the intake air temperature sensor (IAT), manifold absolute pressure sensor (MAP), throttle position sensor (TPS) and some others. If the signal from the MAF sensor is lower or higher than expected, the ECM detects a fault and stores the code P0101 in its memory. In many cars the MAF signal is used to determine the shift pattern of the automatic transmission. Often, if there is a problem with the MAF sensor, the automatic transmission may shift differently. If the MAF sensor is bad, replacing it with an OEM part will insure that further problems won't be caused by an incorrect part. Q: 2004 Chevy Astro van feels sluggish at more than half throttle; ran the diagnostic, the codes P0101 and P0300 came up. What could cause this? A: Check the short and long fuel trims and MAF sensor readings with a scan tool at different RPMs. Check the throttle body and clean it if it's dirty. Check and if needed, clean the MAF sensor. Check the MAF sensor harness and connector for poor connection or damage. Have the exhaust backpressure tested for a plugged catalytic converter; this is a common problem. Q: 2001 Volvo with the code P0101. Could not find any vacuum leaks; the MAF sensor looks clean, what else could cause this code? 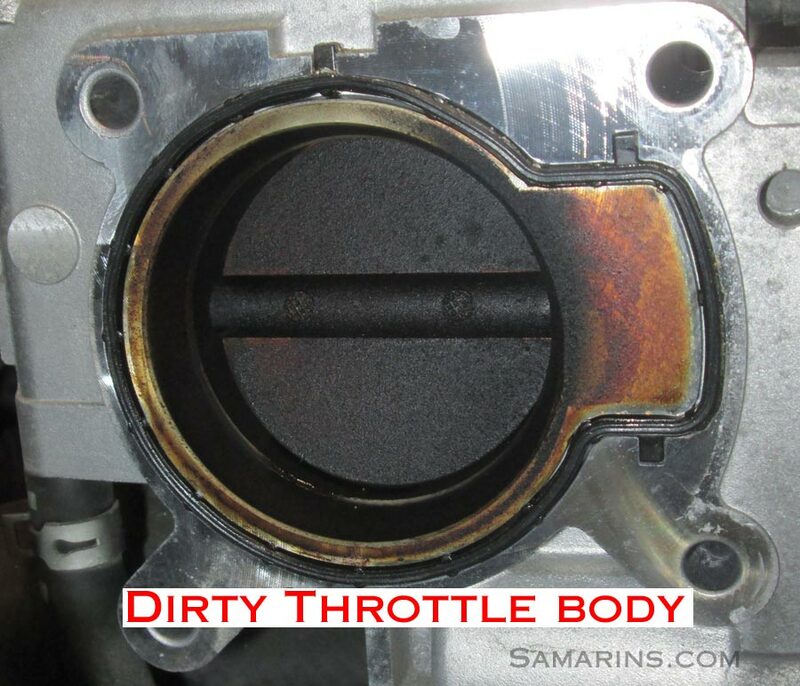 A: Check the throttle body, if it's dirty, clean it. Check the connectors and the wiring at the MAF sensor. If you have a scan tool, look at the short fuel trim numbers at high and low RPMs. If the short fuel trim (STFT) goes lean at low RPMs, it's a sign of a vacuum leak. A leaking purge valve, as well as brake vacuum booster can also cause this problem. Check the MAP sensor; it's used to check for rationality of the MAF sensor. If the MAP sensor is faulty, it also can cause the code P0101.